Hadsar is situated about 13 Kms. 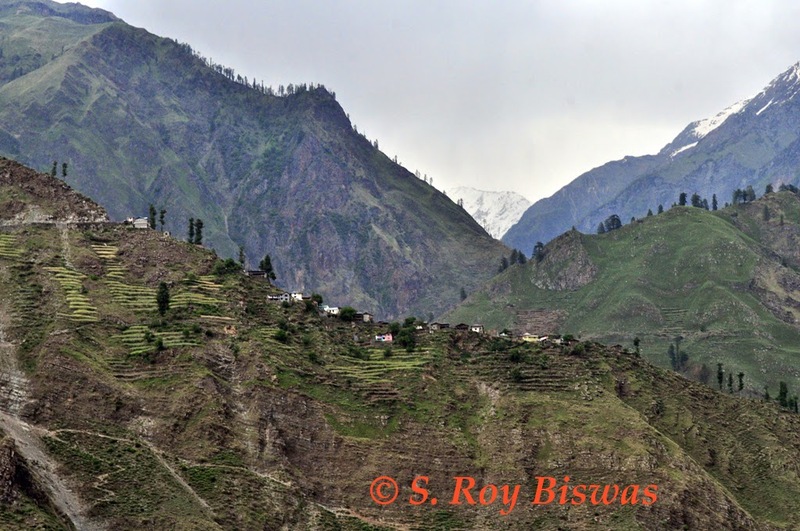 from Bharmour and is the staging point for trekking to the famed Manimahesh Kaislash Yatra, the trek to the famed destination is situated another 14 kms. away, from here. 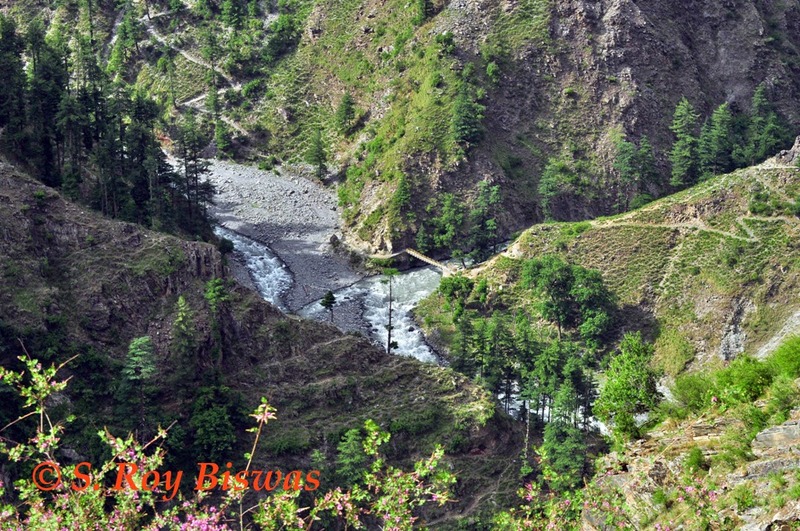 The road from Bharmour to Hadsar passes along the Budhil nullah, a mountainous stream or rivulet and offers spectacular natural vistas. Lord Shiva is believed to reside on this snow-covered mountain of Manimahesh Kailash. The lake and peak are considered sacred and an annual pilgrimage known as the Manimahesh Yatra is undertaken by devout Hindus to the base of the Manimahesh Kailash, where the holy lake known as Kamal Kund is situated. The pilgrimage is held annually in the month of August and September, the dates of the yatra is determined to be held between the holy days of Janamastmi to Radha-astami every year. 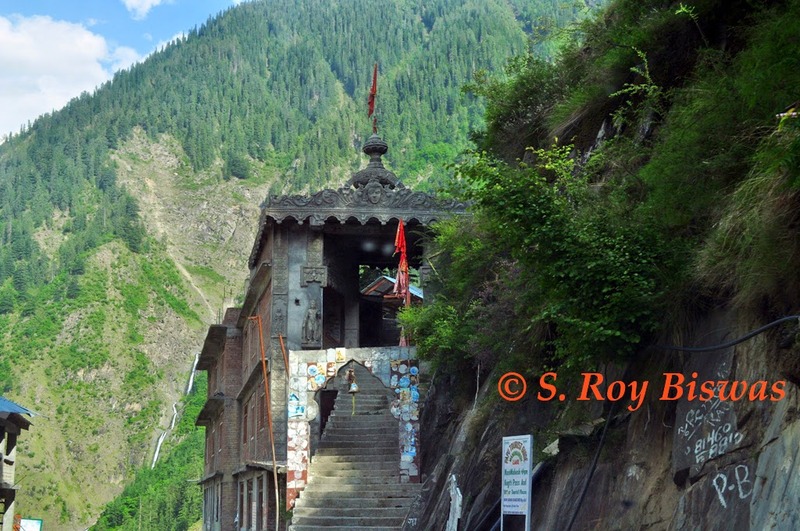 It is believed that on this occasion, both Lord Shiva and Goddess Parvati take bath in the holy Gauri kund/Lake. For participating in this holy pilgrimage, tens of thousand of people come in from the various nooks & corners of the State and also the country and abroad. The glorious views of Manimahesh Kailash early in the morning at the time of rising sun creates an geological phenomenon known as the ‘Manimahesh Mani darshan’ that stirs the hearts & mind of the visitors. 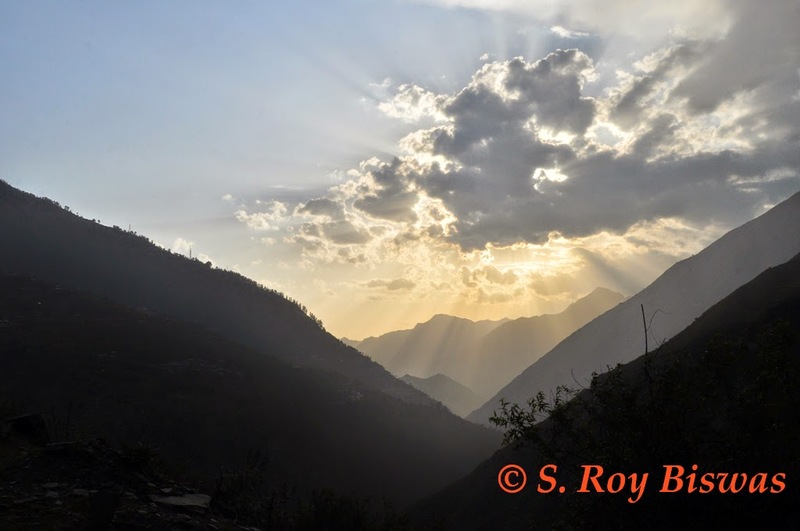 This phenomenon occurs when the first rays of the rising sun peeps through a small hole or gap atop the mountain top, glowing like a gem or ‘mani’ (in Hindi), which the pilgrims wait to watch with bated breaths. It is known about Manimahesh Kailash that no one has ever been able to climb up to the peak/summit and anyone who has tried to do so has either died or turned insane. Local legends also state that the out rock projections of the mountain peaks appear as human-like figures and it is said that one resembles a hermit, while the other resembles a shepherd, frozen stiff during their futile effort to reach the top of Manimahesh Kailash. 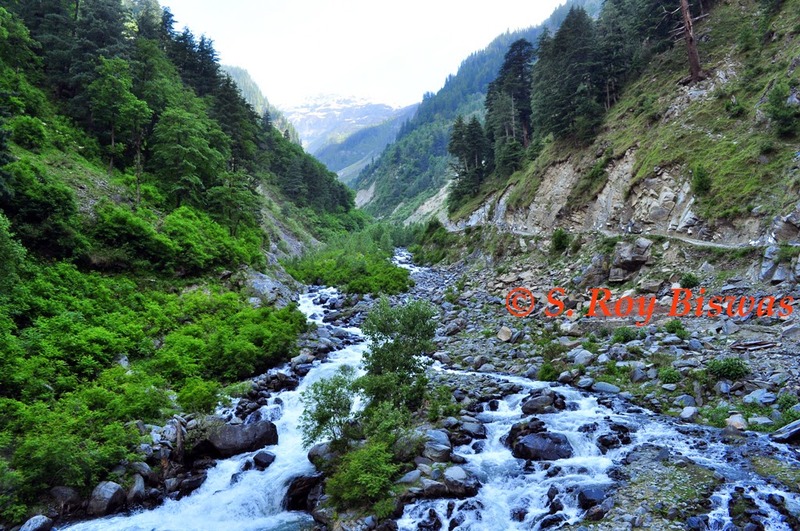 Many holy places come on the way, during trek to Manimahesh Kailash, starting from the base at Hadsar, after treeking a distance of 6 km on reaches Dhancho, which is famous for water fall and many pilgrims rest for the night here. 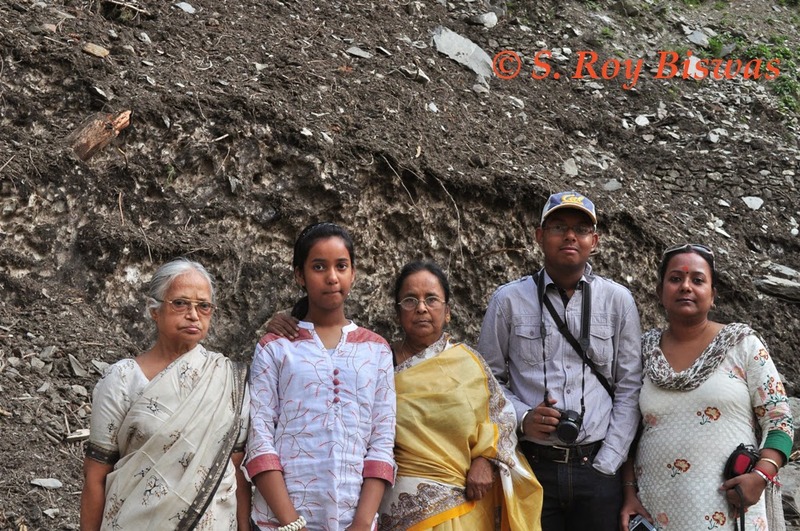 Beyond Dhancho, at a further distance of 5 Kms. 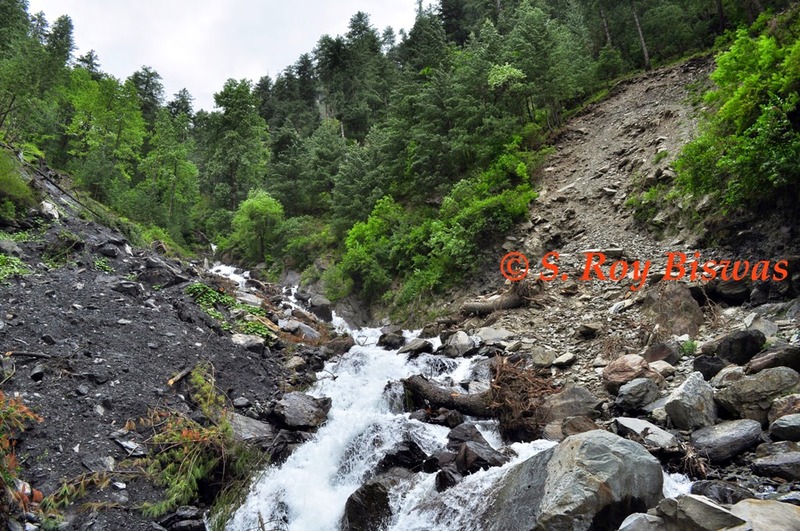 is Gourikund, ‘Gauri’ is another name of ‘Parvati’, the consort of Lord Shiva, on this trek route one comes across an interesting destination where a large water appears to flow from behind the rocks and it is called the ‘Shiv Gharat’. A dip in this lake is considered sacred because it is believed that Parvati used to take bath in this lake and only ladies are allowed to take dip in this kund. After traversing another one kilometer further from Gauri Kund, lies the Shiva Kalotri spring, considered to have its source from Lord Shiva's feet in Manimahesh Kailash. 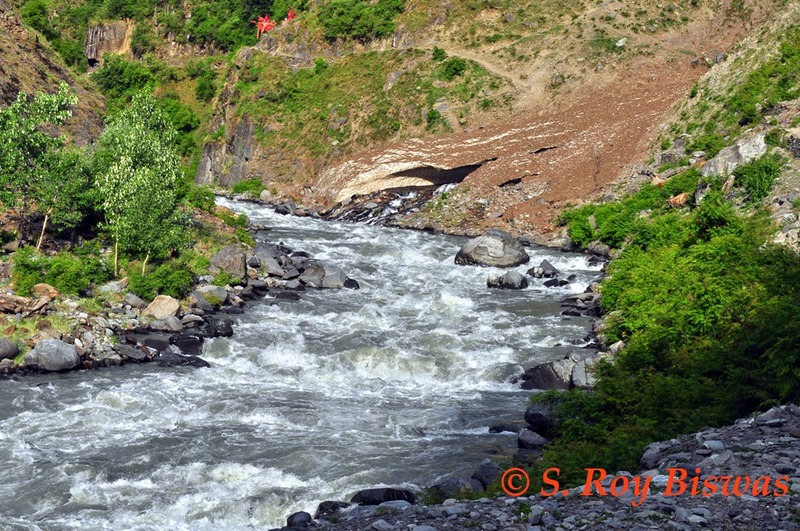 Two kilometer ahead of Shiva Kalotri is Kamal kund, which is situated at the foot of Manimahesh Kailash. After a short run from Gauri kund, one reaches the Manimahesh Lake or Kamal Kund, which is a shallow circular lake that provides an enchanting scenario, with the peaks reflection in its clear waters. A roofless temple, conspicuous with many iron trinkets, is seen on the opposite side. For beginner trekkers, Manimahesh trek is the best route for beginning, as the gradient is easy and it also provides for a pilgrimage visit to Manimahesh Lake. 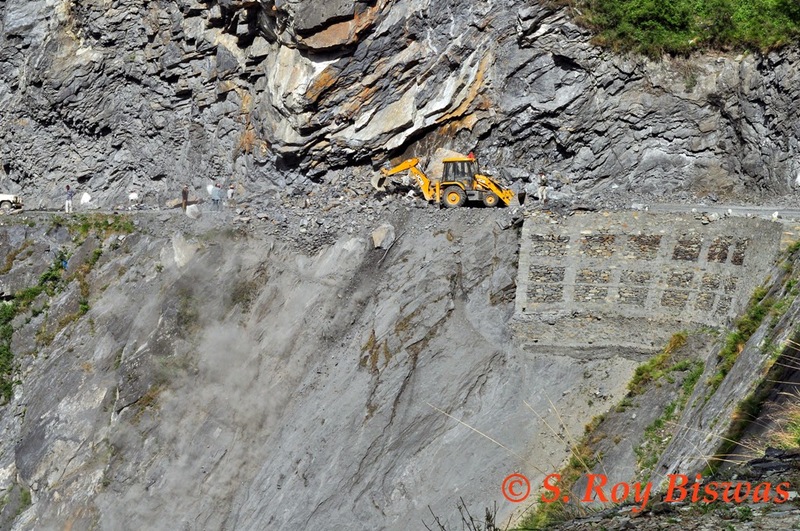 The government too has made efforts to provide all kinds of help to the pilgrims visiting the destination, by placing Generator sets at suitable intervals all along the Manimahesh Yatra route, thereby providing for movement of pilgrims even during the night. 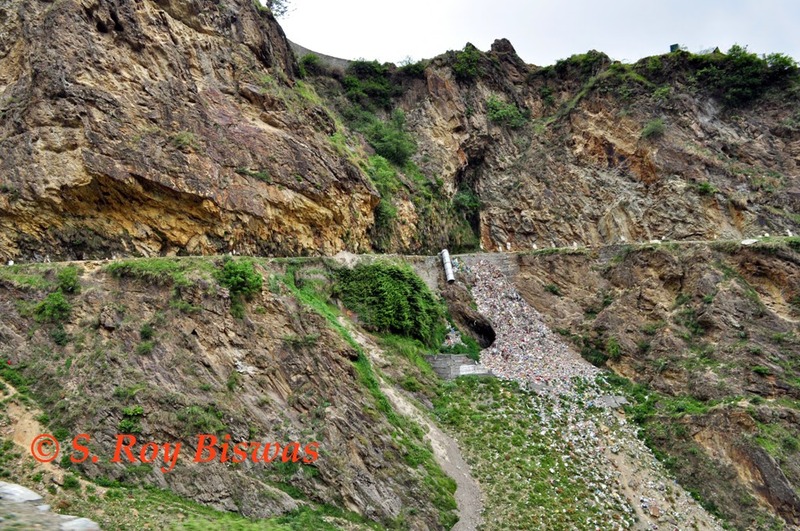 Initially, this Yatra was one of the most difficult ones, with people trudging up from Bharmour itself by foot, but with passage of time motorable roads have been constructed right upto Hadsar and also Helicopter services are now available from just below Bharmour to Gauri Kund for the pilgrims. 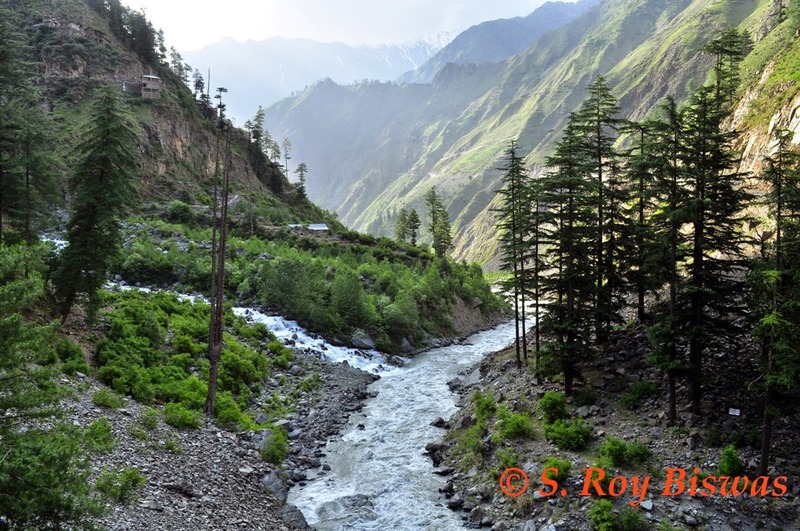 Beyond Hadsar, one crosses a wooden bridge constructed across the mountainous stream coming down from the Manimahesh peak and as one moves forward, one comes across a larger bridge across the Budhil River. 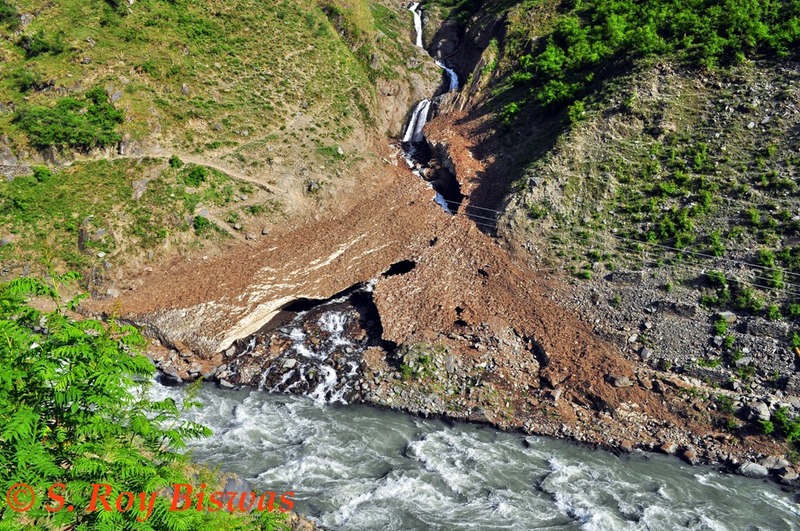 Just before we crossed the bridge, we saw a huge glacier that had slid down onto the road during the recent rains in April/May that hit the region and it took days to break it and move it across the road, although the tail end remains firmly entrenched by the road side till date. We found a local Gaddi woman breaking a piece of the ice with a stone and eating the central part of the ice block and on query she informed that they are used to getting their water intake in this manner, as when they are grazing their sheep & goats high above in the mountainous meadows, since even the flowing water may be infested with worms etc., they tend to eat or use snow from glaciers to satiate their thirst. After crossing the bridge over the Budhil River, there are two roads bifurcating, one going towards the left, which was partially damaged and the driver informed us that the same leads to villages across the valley and that during the Manimahesh Yatra the vehicles are parked upto kilometers ahead on this road. The road leading to the right hand direction, leads towards Dharol and now motorable road for another 3 Kms. ahead has been completed, which leads to the Kugti village, after a further trek of 4 odd Kms. from the point one disembarks from the vehicle. This road was a wee bit narrower, but the scenic beauty around was mesmerizing. A little further ahead we came across a small glacier, which in turn was being fed by a series of waterfalls (maybe from another glacier atop the mountain? ), which finally merged with the Budhill rivulet below. 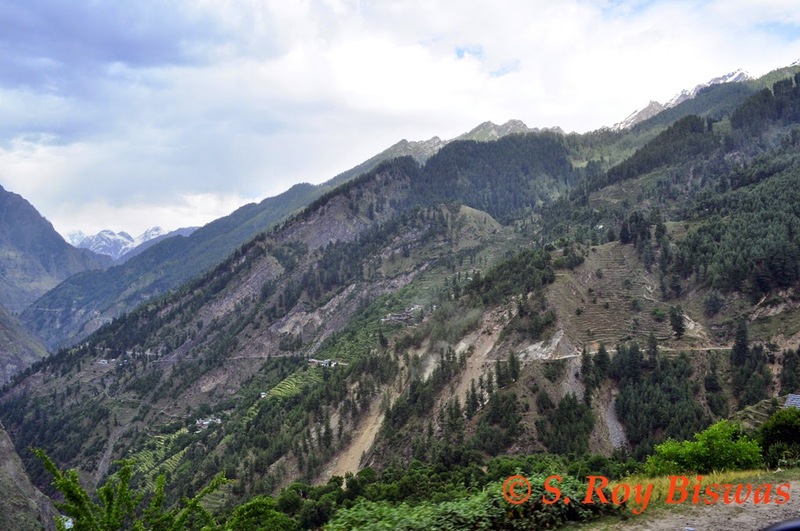 It was one of the most scenic destinations ever been visited by me and reminded me of my visit to Kinnaur Valley of Himachal Pradesh a couple of years ago. 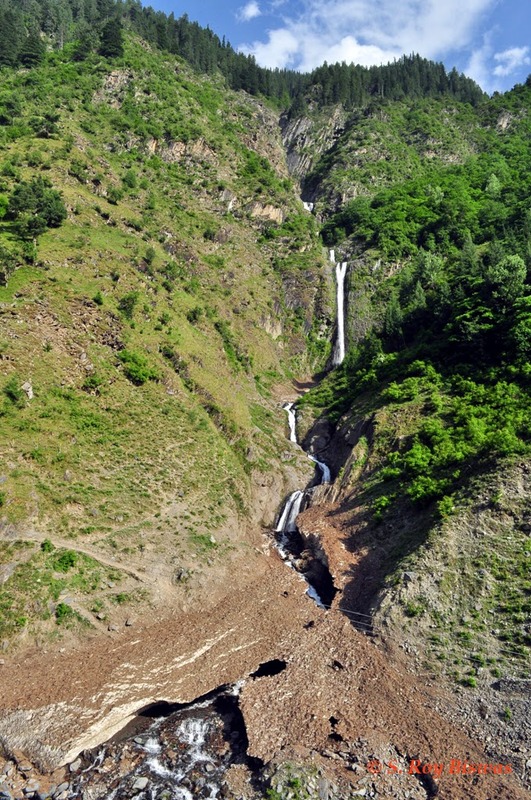 However, just across this huge waterfall across the road, my son pointed out to some sound of running water emanating from behind the rock face along the road, I too could hear it and concluded that it was the echo of the water fall coming from a concave rock structure, which was providing for such a feeling, akin to ‘Shiv Gharat’ from Manimahesh trek? As we were not inclined to visit Kugti, we stopped a little ahead of Dharol and turned back, as we intended to return back to Bharmour before nightfall. 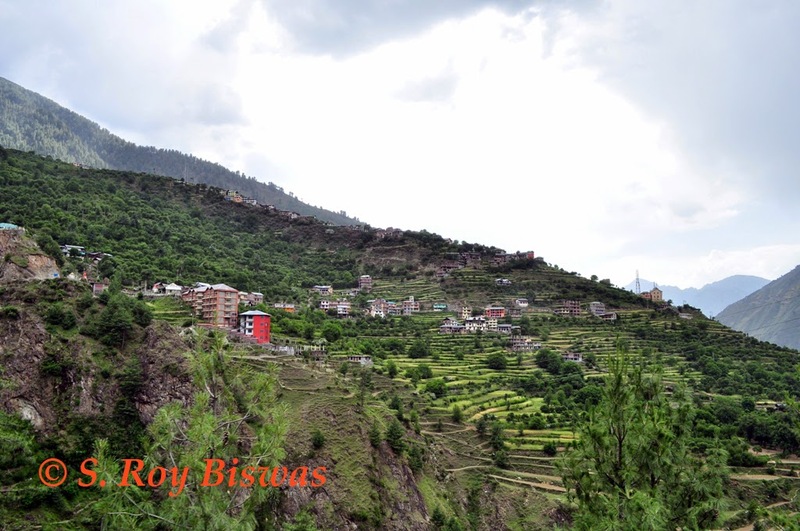 For information of my blogs follower, Kugti Wild Life Sanctuary is located at an altitude of 2250 meters and approachable through the trek route running through the Kugti Village. 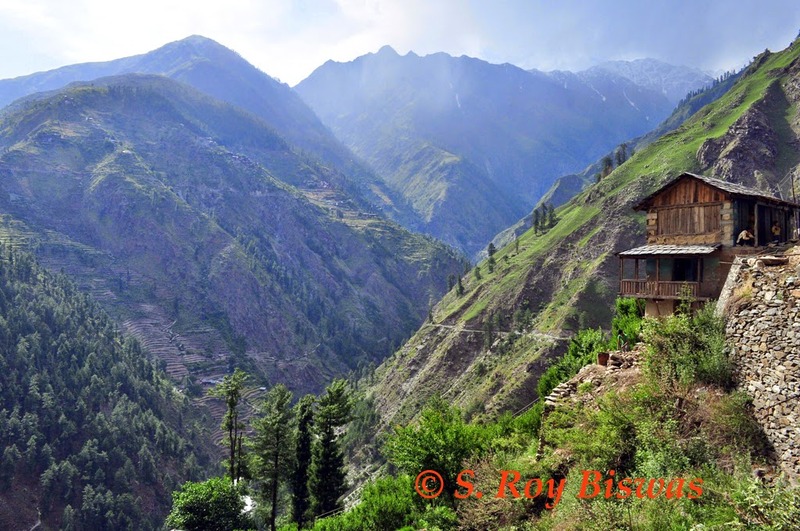 This sanctuary offers spectacular view of the Pir Panjal ranges of the inner Himalayas. 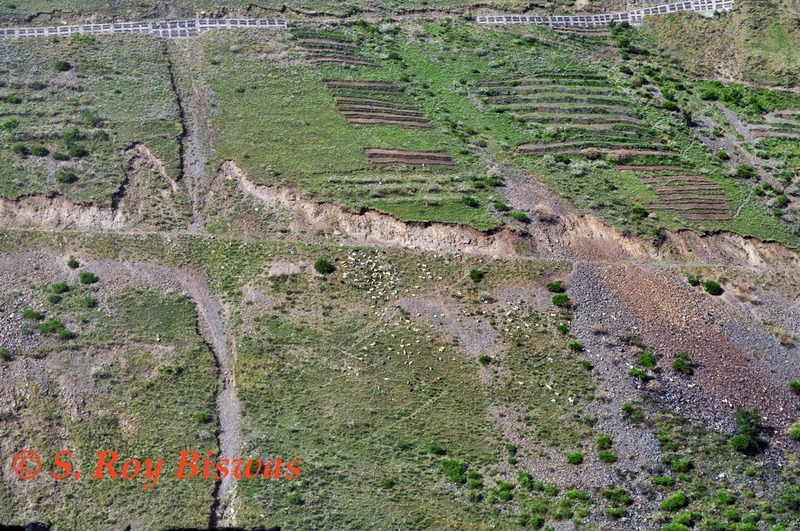 The topography of the area is mountainous having altitudinal range of 2000 meter to 5000 meters from sea level, and includes different zones like temperate (2000-2800m), upper temperate (2800-3300m), sub-alpine (3300-3600m) and alpine zone >3600m. From December to March, temperature hovers near freezing point, with copious amounts of snowfall on the passes. The change over from winter to summer is gradual. During March and April, weather is cool and bright, and the temperature begins to rise rapidly after the middle of April and continues to rise till end of the rainy season in July. The nomads of ‘Gaddis’ have their own methods of calculating the ideal time to take their flocks to the mountains above for grazing and the trekkers usually start their hikes after the first of the ‘Gaddis’ have started their climb across the passes. However, this year there was a bout of snowfall at end of April & early May, 2014 thus, delaying the movement of the Gaddis. The months of October and November in this region are comparatively dry and cold weather usually sets in by the middle of November. The annual rainfall in the Kugti wildlife sanctuary is recorded 1400mm. The south facing physical environment in the Kugti wildlife sanctuary can be described as rocky terrain with frequent outcrops of huge boulders, slate and rock faces while north facing part of sanctuary are having dense mixed forests, rich in high-altitude Himalayan wildlife, and is one of the last homes of Himalayan tahr in Himachal Pradesh. 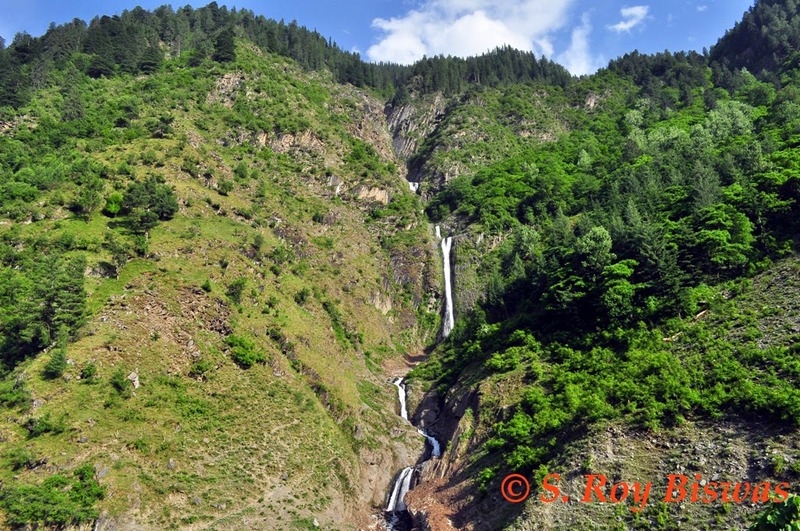 It is also well-known as a source of many medicinal plants, abundant water resources, many originating from glaciers and a diverse topography add to the attraction of the area. To the west it is connected with Tundah Sanctuary by a forest corridor. The best periods for visiting the sanctuary are May-October, when the weather is dry & clear. 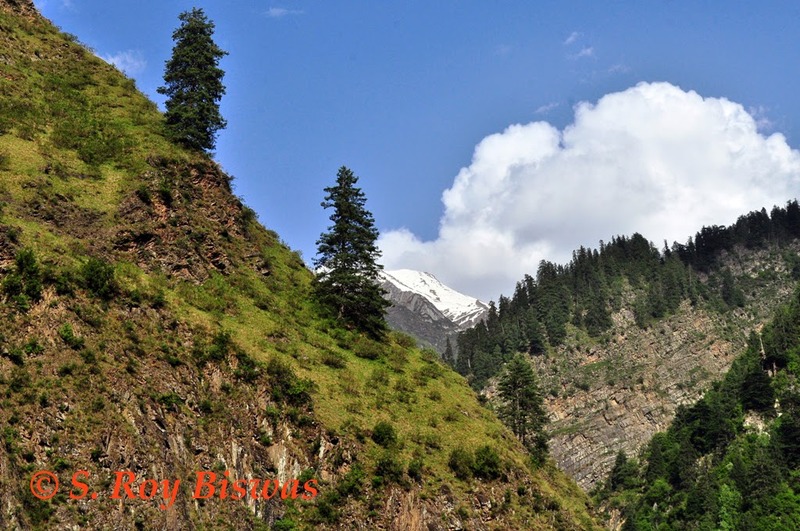 Kugti is snow bond area and bonded with snow for four to five months in year. 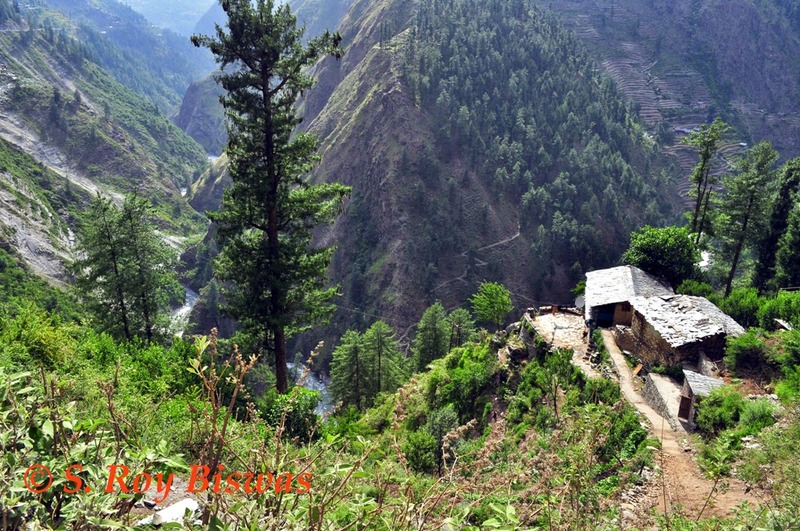 Kugti is also famous for its proximity to the Kartik Swami Temple and trek route to Lauhal and Spiti across the Kugti Pass. Tundah Wildlife Sanctuary too lies in vicinity of the Kugti Sanctuary, with good, though disturbed, habitat for Himalayan Thar, Ibex and pheasants. The area also supports a small population of Musk deer. It is connected to Kugti Sanctuary by a forest corridor to the east. Forest type includes Moist Deodar Forest Western Mixed Coniferous Forest and Alpine Pastures. Kail and Deodar were planted for commercial timber. A way goes through Tundah sanctuary to Lauhal valley over Kalicho Pass via Banni Mata. This sanctuary is almost same as Kugti sanctuary but differs a bit because of minor changes in its climate, temperature and topography. The sanctuary has a rich collection of birds, medicinal plant and herbs. Tundah sanctuary is easily approachable from road and can be visited through dense forest of sanctuary with experienced guide. (Information regarding Kugti Wildlife Sanctuary & Tundah Wildlife Sanctuary has been obtained from the net).